I found a beautiful mother of pearl thread keeper at The Workroom, a beautifully curated quilt shop in Toronto. I had seen these thread keepers and wanted one but I didn’t really need an embroidery thread holder! I finally caved in and bought one. 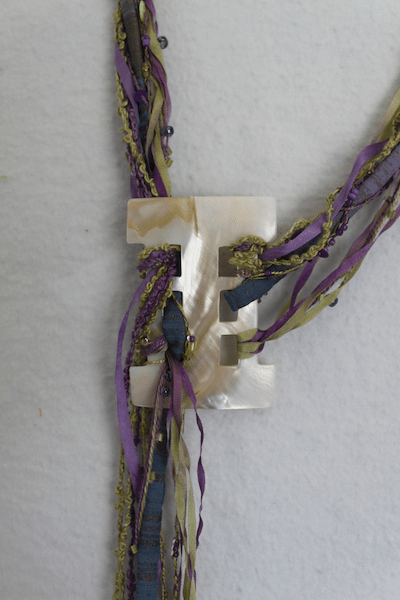 It was after I attended the Creativ Festival and saw the gorgeous hand dyed threads from Nell’s Embroidery that the ideas coalesced into a fibre art necklace. The mother of pearl thread keeper that you can see here from The Workroom’s online shop along with a package of hand dyed embroidery threads from Nell’s Embroidery was incorporated into this piece. Each package contains five metre lengths of silk and rayon ribbons, perle cotton thread, boucle, chenille and perle cotton threaded with beads. 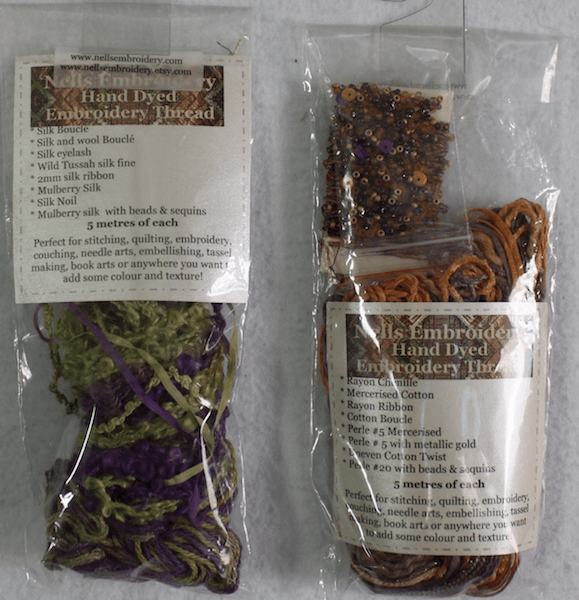 They are hand dyed and luscious! I bought a couple of colour ways after much deliberation. I incorporated these fibres along with a co-ordinating piece of fabric that was rolled into a tube and created this piece. I love the way it turned out. So, I have a piece that holds thread just not in the way it was intended!